Pregnant guests are welcome to visit the Dungeon at any time during their pregnancy and can take part in all nine (9) shows in our tour, however those expecting should not board Shanghai Kelly's Show as a precaution. Please inform our ‘Dungeon Keepers’ (Show Operators) that you wish to bypass the show and they will show you into the next part of the tour. This will not affect the rest of your experience. 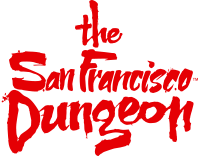 The San Francisco Dungeon tour is a 60 minute walking experience and guests will be expected to stand in the majority of shows as there is not always seating available in the show area. The San Francisco Dungeon is dark in areas, with uneven flooring and there are stairs which you will need to be climbed throughout the attraction. Due to the nature of the attraction you should expect jump out scares, unexpected frights and two shows include shaking floor effects. You can leave the tour at any stage during your visit to us. Please speak to the actor who will make sure a member of the management team comes to show you to the exit. If you require first aid assistance at any time, we always have a registered first aider on site. We have toilet facilities at the beginning and end of the 60 minute tour experience. If you need to use the bathroom at any time during your tour please let the actor know and they will arrange this for you. You will then be able to re-join your group after visiting the facilities. If you have any questions please do ask a member of our team.